After a rustic night at a homestay in a wee village outside Chiang Rai (complete with a traditional Thai music performance from the kids at the local high school), we were off into the mountains with our lovely (read frustrating) group. James and I are travelling with about 10kg of stuff each(including some diving bits and pieces, mosquito nets, first aid kit etc) between us. The people in our group had around 35kgs of gear each (not including any handy travel essentials). A girl from the UK had 3 enormous bags just for herself (including large size shampoo, moisturisers, foot scrub, 6 headbands etc). 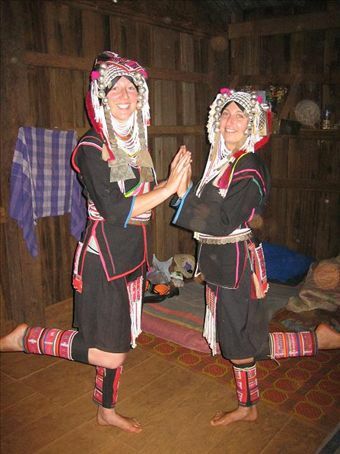 So you can imagine what they were like in the isolated hilltribe areas of Northern Thailand. Especially the one who was addicted to Coca cola and drank a whole litre for breakfast each morning. She mainly lived off Coke, Pringles, Mentos and various other highly processed packaged goods. It took us about 7 hours to reach our hut. This included about 4 hours of actual walking, but some people needed pretty regular (as in , every 20 minutes) breaks. Our highly un-hilltribe accommodation had showers, western toilets, a fridge with soft drinks and a view over the country side. It would have been beautiful, if the locals did not practise shifting cultivation. This is where you burn off pristine native forest to clear the land, plant a cash crop (in this case, coffee), get two or three crops off it, and when production drops (because the soil doesn't hold many nutrients - it all disappears with the forest when you burn it off) you just move on to another piece of land, and burn off the forest there too. And I don't even have a forestry degree!! The second day of our trek took us to an Akha village. It was so cute. There was no mud, smelly sewage or slummy areas. We stayed in a bamboo hut with no electricity. We washed in a bucket of freezing cold water and used authentic toilets. Dinner was rice and a local green vegetable. Our host was so friendly - he spoke to us in Akha, which was translated into Thai by the local priest, which was translated into English by our guide. He collected coins from around the world, so we added some rupees to the collection. He loved seeing the 6 wedding photos in my diary - so much that he took photos of my photos!! Then he got out his wife's wedding outfit (think all black, huge headgear with silver balls and beads) and got me to try it on! You can just imagine how excellent all 175cm of me looked in an outfit made for someone 40cm shorter. And James looked stunning in his hand embroidered waistcoat. Once dressed up in our hilltribe wedding gear, we did a traditional 'dance' which involved loudly banging bamboo poles on a plank of wood. The third day was so hot, we looked like it had been raining on us. We walked through the Doi Chaang (elephant mountain) coffee growing area, and bought some coffee from the local growers (Dad, you just might get to try some of this). The rest of our group piked from the trek when a passing ute picked them up. Only James and I soldiered on and completed the trek. It was a pretty touristy experience, but we had a good time and got an excellent cardio-vascular work out! Hi guy -- great blog and It is quite real... I live in chiang rai and ened up there becasue i was passing thru a long time ago and loved it so much.